His Highness the Emir Sheikh Tamim bin Hamad al-Thani issued on Wednesday the Emiri Decision No 13 of 2018 forming the Board of Trustees of Qatar National Library (QNL). The decision stated that the Board of Trustees of QNL shall be composed of HE Sheikha Hind bint Hamad al-Thani, as chairperson, and HE the Minister of Culture and Sports, as vice-chairperson, along with the following members: HE Dr Hamad bin Abdulaziz al-Kuwari; HE Sheikh Dr Abdullah bin Ali bin Saoud al-Thani; and HE Dr Hessa Sultan al-Jaber. His Highness the Emir Sheikh Tamim bin Hamad al-Thani issued on Wednesday Law No 4 of 2018 regulating electricity and water supply. The law is effective and is to be published in the official gazette. His Highness the Emir Sheikh Tamim bin Hamad al-Thani on Wednesday issued Decree No 19 of 2018, on allocation of a land for Qatar General Electricity and Water Corporation, to set up a solar power plant. 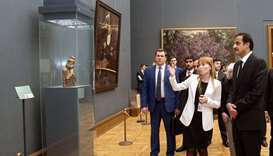 The decree is effective starting from its date of issue and is to be published in the official gazette. His Highness the Emir Sheikh Tamim bin Hamad al-Thani issued on Wednesday Law No 5 of 2018, on national service. The law is effective starting from the following day of its publication in the official gazette. 1. An Instrument of ratification approving a draft agreement on encouraging and protecting mutual investments between the governments of Qatar and Paraguay, signed in Doha on 11/2/2018. 2. An instrument of ratification approving a draft memorandum of understanding in the agriculture, livestock and fisheries field between the governments of Qatar represented by the Ministry of Municipality and Environment and Oman represented by the Ministry of Agriculture and Fisheries, signed in Muscat on 28/1/2018. 3. 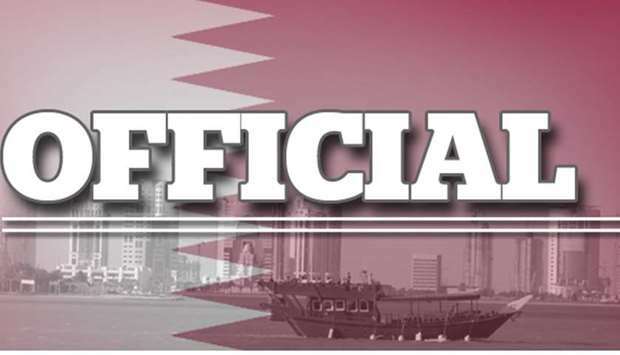 An instrument of ratification approving the ratification of a co-operation agreement in the sports field between the Ministry of Culture and Sports in Qatar and the ministry of sports and youth in France, signed in Doha on 1/2/2015. 4. An instrument of ratification approving the ratification of a memorandum of understanding on co-operation in the health field between the governments of Qatar and Indonesia, signed in Jakarta on 18/10/2017. 5. An instrument of ratification approving a draft air services agreement between the governments of Qatar and the Ivory Coast, signed in Abidjan on 23/12/2017. 6. An instrument of ratification approving a draft agreements between the governments of Qatar and Paraguay on avoiding double taxation and preventing of financial evasion with related to income taxes and the draft protocol annexed to the draft, both were signed in Doha on 11/2/2018. 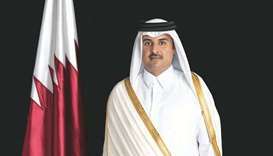 His Highness the Emir Sheikh Tamim bin Hamad al-Thani issued Decree No 18 of 2018 approving the Memorandum of Understanding (MoU) on the establishment of a joint committee between the governments of Qatar and Indonesia, signed in Jakarta on 18/10/2017 and annexed to this decree, which shall have the force of law in accordance with Article 68 of the Constitution.